మచ్చ light colour లో ఉంటే a light mole on అని రాయాలి. అసలు మచ్చలు లేక పోతే scar ఏమైనా వుందా అని check చెయ్యాలి. Hip = either side of the body below the waist and above the thigh. A dark mole on the chest A light mole on the left abdomen. 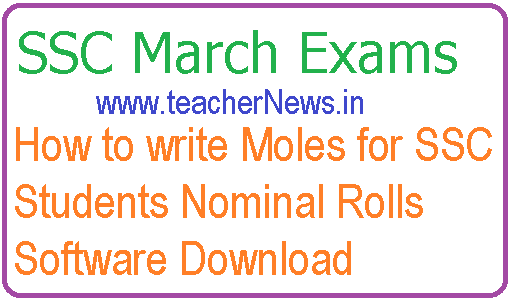 How to write SSC Students Moles, AP Telangana SSC Nominal Roll Preparation Software for 10th class Public Exams for Academic Year 2018-19. 10th Class /SSC March 2019 Nominal Rolls Software.